If you are trying to plan a trip to Painted Cave on Santa Cruz Island, please check in with us in January of 2019. 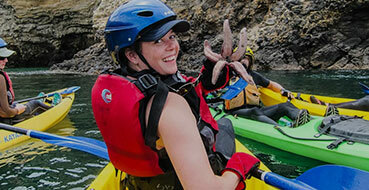 That is when we will start posting available dates for the Painted Cave Kayak Tour in California Channel Islands! This amazing sea cave is one of the largest in the world, extending a quarter-mile long with an entrance ceiling of 160 feet. Painted Cave trips depart from Santa Barbara Harbor; guests will stay on the boat all day and kayak/snorkel from the boat. Sit back and take in the beauty of the Santa Barbara Channel while we take care of all of the details. You will receive a continental breakfast on the ride to the island and a hot lunch on the ride back; these meals are included in the price of your trip. All trip dates require minimum numbers and are subject to cancellation due to weather conditions. Call our office for the most up to date information and availability. Want to read more about Santa Barbara Adventure Company’s tour of Painted Cave? Book your Painted Cave Kayaking trip online.